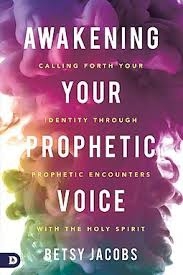 Awakening your prophetic voice: Calling forth your identity | Karmal Books online Christian books and media store. In this powerful, engaging book, Betsy Jacobs brings you into prophetic encounters where you will hear God's voice and learn to prophesy what He is saying about you. You don't have to wait for someone else to give you a prophetic word. As you begin to hear God's voice and speak His Truth over yourself, you can walk in the identity and destiny for which you were made! Discern prophetic "hearing and seeing" moments where God is communicating uniquely to you. Transform the sphere of influence you've been called to by prophesying words of life and Truth. You don't need to rely on the prophetic words of others to access your destiny. Prophesy God's truth over your life today!